The first post to Lumberjocks was this review, which I posted in the Forum, Under Tools etc. It was recommended that I re-post this review in the Review section of Lumberjocks. Purchase. I have been woodworking as a hobby since 1985, but never owned a bandsaw – until now. Previously, I re-sawed on the table saw and used the jig saw & router for curved cuts. Before making my bandsaw purchase, I saved my money and researched bandsaws. I considered 14” to 19” bandsaws from every manufacturer I could find, eliminating any bandsaw that did not offer cast iron. Major considerations were the footprint and table height, access to and adjustability of upper and lower blade guides, a blade de-tensioning mechanism, a blade brake, and dust collection. There were other considerations, such as overall height (I had to get the machine in my 2 car garage workshop) and value (what I got for the money). Most of all, I wanted this first bandsaw purchase to be my last and to avoid buyers regret by under-buying. I read every bandsaw review and watched every YouTube video I could find. In the end I concluded that the Grizzly G0636X 17” 5 hp bandsaw offered me the best value, so that is what I bought. I also purchased a de-greaser, the Shop Fox mobile base model D2058A and lift gate service, all from Grizzly Tools. In addition, I bought a Lenox 161”x1/2”x.025”x3 Tri-Master Carbide Bandsaw Blade from Industrial Blade & Products. Total cost was about $2800 for everything. Receipt. I ordered the bandsaw in December 2014 and received it 6 days later. It arrived in a slatted crate on a pallet. All parts were present and nothing was damaged. I rented an engine hoist with sufficient weight capacity to handle 1000lbs (the bandsaw weighs 620 lbs.) and a maximum lifting height of 105”. I prepared the mobile base, hooked up the engine hoist and with a helper, lifted the bandsaw off the pallet, slid the mobile base under the swinging bandsaw, and slowly lowered it onto the mobile base – all in the driveway. With the bandsaw secured to the mobile base, it rolled surprisingly easy into the garage with 1” in door height clearance to spare. The fit and finish of the bandsaw and its components was excellent. Setup. There was some setup required, but surprisingly little. The manual was clear enough for me to follow, which I read both before and when the bandsaw arrived. The degreaser easily removed the protective film on the cast iron. Since the machine did not come with a power cord, I purchased a 10 gauge power cord (for a 30 amp circuit 240 volt circuit) as well as a 240 plug from Lowes. 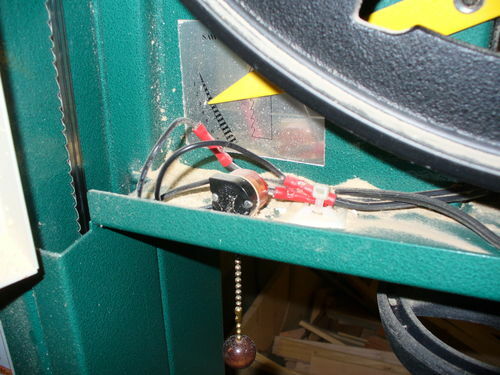 The electrical connection to the bandsaw was easily made. I installed the 1” blade Grizzly shipped with the machine, tracked the blade, adjusted the roller bearing guides with little difficulty, and turned the machine on. It started right up and ran quietly and with little to no vibration. Then came the test cuts. I positioned the included resaw fence to make a 1/8” resaw cut from a 6” tall ¾” wide board. The machine cut smooth and true with no detectable drift leaving me with a board 1/8” thick. The thickness of the re-sawn board was consistent along its 2’ length. Other test cuts were true. Unlike the apparent experience of others, the factory included blade worked fine – but then it was new and sharp. I found the YouTube video entitled “Band Saw Clinic with Alex Snodgrass” regarding the setup of a bandsaw to be most helpful. I followed Alex’s advice with great results. What became clear to me was that someone in the manufacturing process spent some time with this saw. Without making any adjustments I found the blade tracked to the center of the upper wheel, the table was perpendicular to the blade and rested firmly on the 90 degree stop, the fence was parallel to the miter slot, and motor belt tension was as it should be. Other things I noticed is the de-tensioning mechanism is firm and tight indicating a strong spring, smooth and easy rack and pinion adjustment of the blade guard, good access to the upper and lower blade guides; the table is heavy, flat, and smooth, and easy table tilting with a rack and pinion mechanism. If Grizzly went cheap anywhere on this saw, I could not find it. The one enhancement I would have liked to have seen is a switch that prevents the bandsaw from running while the blade is de-tensioned – like that on Powermatic’s 15” bandsaw. I added a signaling device which is described below, to alert me when the blade is de-tensioned. Use. Over the past year, I used the bandsaw with no performance issues. After figuring out how to use the machine I installed the Lenox carbide tip bandsaw blade. I have done some resawing, ripping, crosscutting, circle and curve cutting. The foot pedal brake works well and when depressed shuts off the machine as well as bringing the blade to a stop. I thought the motor brake was more important than it is. I rarely use the brake, but when I do, I am glad I have it. The bandsaw continues to cut straight and true with no drift. At 5 hp, it has plenty of power, more than I expect I will need. But if I ever have a 12” wide piece of oak that I wish to resaw in the future, I do not have the worry of bogging down the saw or leaving burn marks on the wood. I only had a ½ hp dust collector so I blocked off the lower dust port to maximize air flow at the upper most dust collection port. The lower wheel chamber remained free of saw dust using only the upper dust port. Since then, I upgraded my dust collection and now use both the upper and lower dust collection ports. 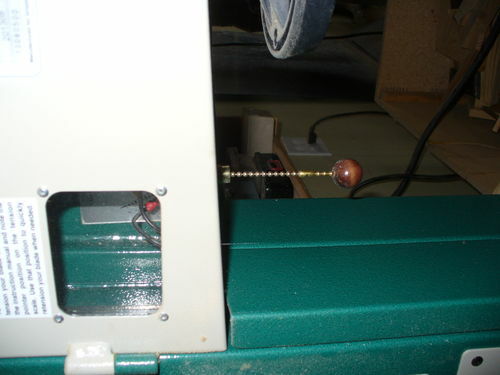 I did modify the bandsaw by adding a signal device to alert me when the bandsaw blade is de-tensioned. It consists of a board mounted on top of the saw secured by one of the lifting eye bolts. The board is long enough so that the end is directly above the edge of the table when angled to be in line with the blade. An eye screw is mounted at the end of the board. A shoe string loops though the eye screw and is secured to the de-tensioning handle. The other end of the shoe string is attached to a scrap block of wood, wrapped in red electrical tape. 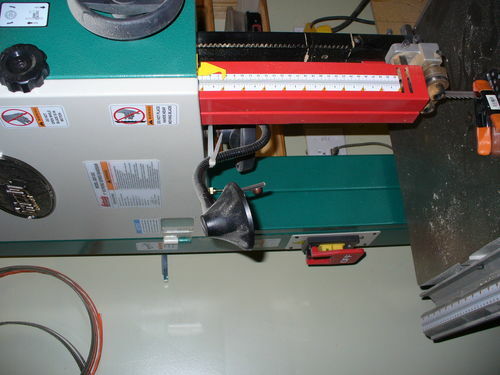 When the de-tensioning handle is in the de-tension position, the wood scrap block rests on the edge of bandsaw table in line with the blade. When the de-tension handle is positioned to apply tension the blade, the scrap wood block is pulled up and is out of the way. Opinion. Although expensive and probably way more than I need (the Powermatic PWBS-14CS 14” bandsaw would probably have been adequate and was my second choice), I highly recommend the Grizzly G0636X bandsaw. It includes 1) a cast iron fence that supports the included two position (tall and short) aluminum resaw fence and a miter gauge. This is my first Grizzly machine. Other machines I own are sold by Sears Craftsman, Woodmaster, Powermatic, and Clearvue. I have no brand loyalty, rather when buying a major tool; I look for value trying to ensure that I get the most for my money regardless of the name plate. Based on this purchase, I would buy Grizzly again if the machine meets my value test. Although I have yet to make a bevel cut, the rack and pinion table tilt mechanism will make accurately changing the table angle easy. Blade changing and adjusting is straightforward and relatively quick to perform, with good access to the lower blade roller bearings. The machine has been reliable and no remedial adjustments have been necessary – it keeps its settings. Dust collection is effective. It has plenty of power and with the Lenox Carbide blade, cuts easily. I am very satisfied. The only problem I encountered with the G0636X is the aluminum portion of the fence lightly drags the table. I would have liked maybe a 1/16” clearance from the table top to the bottom of the aluminum fence for saw dust and ease of movement. Nonetheless this is more of a nuisance than a major problem. Even so, moving the fence into position is done accurately. While assembling the Shop Fox mobile base, I snap off one of the bolts that hold the stand together; because I over-torqued the bolt. I wanted it tight due to the weight of the machine. I did not think about whether the supplied assembly bolts were hardened or not nor did I think I could snap the bolt with a 9” long ratchet wrench. Since the bolt was securely seated and snapped where the remaining bolt had plenty of holding power, I continued with the assembly of the stand – not repeating the over-torqueing mistake. In summary, the sting of its cost has faded, but the Grizzly G0636X continues to be a pleasure to use. Really good review, thanks! That thing is a beast of a bandsaw! What’s the saying? When you buy a quality tool it hurts once. When you buy cheap it hurts every time you use the tool. Thnx for your detailed and well explained review. Looks like a beasty of a machine. Thanks for the review. I have the standard 17” Grizzly and love it. I wish I had the rack-and-pinion table adjustment. Thanks for the review. If I ever have the chance to upgrade my old Delta, Grizzly would be on my short list. Good policy. I also prefer to consider getting “bang for my bucks” rather then worrying about brand loyalty. I bought the exact same band saw one year ago for CHRIST-mas. Belated congratulations your your Christmas gift! Like me, you have had it for just over a year. I am wondering whether you share my opinion concerning the saw, or have you had a different experience? I agree with you review but I replaced the switch , I installed a light and I wish I had bought the version with the brake. I installed the saw on 4×4, as originally it was too low for me. When un-crating this saw,I picked it up all by myself and I destroyed my shoulder. My shoulder now feel OK again. Why did you replace the switch? You gotta hate buyer’s regret. Over time I discovered that spending a lot of money on whatever item and not getting exactly what I could have bought haunts me with the buyer’s regret. I have since determined to simply save my money for however long it takes, bit the bullet, sometimes biting hard, and get exactly what I think I would really like. For those who may not know, Grizzly makes two models of this same bandsaw. One has a motor brake which stops the blade when you press the off switch on the saw. Grizzly says the blade stop in 3 seconds. It has no foot pedal break; I assume because it is not necessary. The bandsaw that b2rtch and I opted for is the other model which offers a foot pedal brake. This model shuts off when the foot pedal is depressed, but the blade continues moving unless one continues depressing the break. But money may not have been the reason you elected for forego the sister bandsaw. I seriously considered the motor break model, but I do not think I fully appreciated its value when I made my selection. I agree, I would prefer to have spent the couple hundred dollars more to get the motor break feature. You have to hate the sting of buyer’s regret. But the foot pedal break works fine. I am glad your shoulder is better. I am not sure exactly how you got the thing off the pallet using pure muscle. I think it weighs around 600 pounds. I will eventually follow you lead and add task lighting to the saw. I just have to find a good one first. My saw has no brake at all. The Grizzly switch which equipped my saw and other grizzly equipment in my opinion is not really safe. It is not a magnetic switch. If you loose power the machine will stop and but switch will stays on. When the power comes back, the saw starts unexpectedly, this can be dangerous. A magnetic switch get dis-energized when the power is turned off. When the power comes back, the saw stays off. You have to re-energize the switch for the saw to start again. This is a safer switch. I almost had a very bad accident with a switch of the previous type, when my joiner started unexpectedly. I am not sure exactly how you got the thing off the pallet using pure muscle. I think it weighs around 600 pounds. I would like to see what you did to mount your task light to the bandsaw. Yes, please post a photo if it is not too much trouble. I briefly looked at the threads in your previous “switch” comment. I am glad you are still with us! Pieces of metal hurled from a machine is like a bullet ricocheting around the shop. I cannot agree more that a magnetic switch is an important, perhaps critical, safety upgrade. From time to time, I have looked for a magnetic 120 volt switch for my router table but have yet to find one. The table is equipped with a simple toggle switch and the table gets moved out of the way when not use. I always have to remember to check the switch position before plugging in the router table. I would like a little greater margin of safety. After reviewing your posts, I tested my bandsaw. I turned it on, cut the power at the breaker, and then re-energized the circuit. I was relieved to discover that Grizzly did indeed equip the saw with a magnetic switch. The saw remained off when I re-energized the circuit. 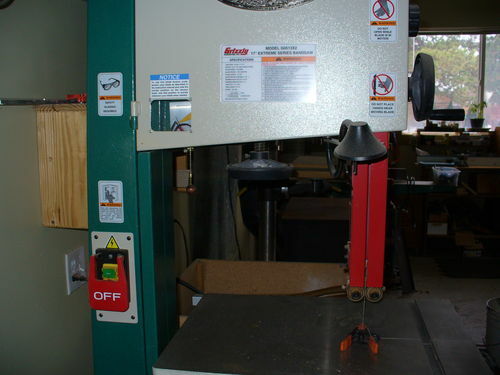 I recently recalled a matter regarding the magnetic switch on 0636X Grizzly 0636X 17” Ultimate Bandsaw inadvertently omitted from my original review. How the Magnetic Switch Should Work. The magnetic switch has a key (like those that come with pad locks) with an “on” and an “off” position. In the “off” position, the saw will not start. The key can be removed. It also has an “on” finger push button that sets flush with the switch plate. The red “off” push button sets proud of the switch plate, and the “off” switch can rotate slightly. If I understood the manual correctly, pressing the “off” button will automatically lock out the “on” button. The “off” button must then be rotated to engage the “on” button. While this feature had no impact on my buying decision, it is pretty cool. What I Found. The automatic lock out feature works, but only sometimes. It works perfectly when firm pressure is applied to the red “off” button. Not so much when the “off” button is pressed just lightly enough to turn off the saw, as I tend to do. I saw no mention of the behavior of the “off” switch under different applications of pressure to the “off” switch. I was concerned this may have been a malfunction in the switch itself, so I contacted Grizzly. I was assured the switch was ok. Initially I thought this was not much of a safety feature, but have since changed my mind. When I am going back and forth to the bandsaw, I turn the saw off with normal light pressure. I am not bothered by having to reset the “off” switch every time I want to use the saw. When I leave the shop, I detension the blade and firmly press the “off” button, engaging the safety lockout. When I return to the shop and to the bandsaw, I have two reminders that the blade is detensioned. First is the detention alert system I mentioned in my original comments and the second is the bandsaw will not start. The safety lock is a reminder that the saw blade is detensioned. I prepared the mobile base, hooked up the engine hoist and with a helper, lifted the bandsaw off the pallet, slid the mobile base under the swinging bandsaw, and slowly lowered it onto the mobile base – all in the driveway. With the bandsaw secured to the mobile base, it rolled surprisingly easy into the garage with 1” in door height clearance to spare. Laughing here because I got the no-nonsense 17” Grizzly and the freight guy could not deliver it to my driveway (where I live most everyone’s garage and driveway are behind the house in an alley, and it’s illegal for 18 wheelers to go down the alley, although another guy did it for me a few years ago). He took it off the truck and we pushed it on a pallet jack down the block, over to the alley, down the alley and up my driveway where the garage door clearance was about 1/4th inch. After he left I had no engine hoist, miraculously got it on a mobile base. Anyway, I can’t say enough good things about my bandsaw, glad you enjoy yours.